In the course of the contract ratification vote, there has been a significant change among the members of our local. For some of us, this is a change we have been working for in more or less organized ways for months or years. We have been raising concerns about our union and working every day to develop in practical terms a different kind of unionism; one that is more democratic, more participatory but also more militant. In the process of these negotiations we have managed to involve (from the beginning of bargaining to the ratification vote) dozens of UAW members who have become activists and hundreds of members who are now aware of and engaged in their union. At UC Berkeley, we have been able to accomplish this because we organized ourselves in an independent caucus (Academic Workers for a Democratic Union). The caucus provides us with a way to work within the official structures of the union, while still clearly and respectfully expressing our differing views of how a union should function—and putting those views into practice. We here at Santa Cruz (G)SOC or the incipient Santa Cruz chapter of Academic Workers for a Democratic Union or whatever we are these days are still a little woozy from the UAW 2865 ratification vote that took place this past week, and we’re still digesting certain aspects of it. On our campus, the “no” side won 187-20, while statewide the “yes” side won 2421 – 1457. Clearly, we are disappointed with this outcome. That said, a lot of positive things came out of this contested campaign. The no vote galvanized people all around the state to build a bottom-up, democratic, fighting union worthy of the name, in solidarity with our students in university struggles. 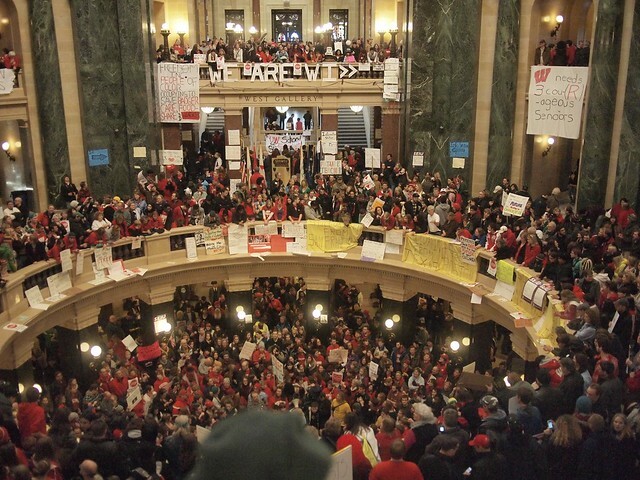 The campaign energized hundreds of TAs, readers, and tutors around the state who have felt disaffected from the union’s official line of march. We took significant strides to broaden and deepen our ties. The history of our local is strewn with former activists who got burnt out by the autocratic, pyramidal, and often bizarrely ineffective organizing style of our union officialdom’s central clique. In the past, those people have usually drifted away from labor politics and campus activism entirely. Now, we have begun to find each other to a degree which is both qualitatively and quantitatively significant. And we’re not going away. Berkeley and Santa Cruz voters rejected the contract in droves, 79% and 90% respectively, with the greatest levels of turnout we’ve had for any union vote in over a decade. 58% of Irvine voters and 41% of Davis voters also voted against this contract. Statewide, election turnout was extraordinarily high, and this was reflective of the fact that people were engaged in a contentious, democratic discussion about the union for the first time in years. There are things about this vote that leave a bitter taste in our mouths. Will the UAW 2865 contract ratification vote be free and fair? There are concerns concerns that votes will be counted in an irregular manner. The chair of the Elections Committee, Fawn Huisman, has refused to share information with the Elections Committee members on other campuses about daily campus turnout figures, despite stipulating before the beginning of the vote that she would do so. When asked the reasons for this change by Elections Committee members and dozens of rank-and-file members, she offered no explanation. This makes it impossible for members of the elections committee to track possible irregularities in campus voting patterns day-by-day. For every previous union election, votes have been counted on each individual campus and the results sent to statewide headquarters. This is the first seriously contested election in the history of the local, since certification at UC Santa Barbara. Use of a transparent ballot box at UC Santa Barbara – one side of which remained transparent days later in the vote after it was first brought to the attention of elections officials. Poll-workers who are paid staff at UC Irvine telling voters how to vote, in violation of a union rule that electioneering must take place at least 10 feet from the polls. Top Administration Caucus members could stuff the ballot boxes and alter the voting rolls at Southern California campuses where are running the elections and have easy access to the ballot box outside of voting hours. Top Administration Caucus members could replace entire sets of ballots from those campuses with “yes” votes and mix the ballots from various campuses before counting them. In light of these concerns, we demand a campus-by-campus tally of the votes tonight so that members can have faith in the results. We also demand that all Elections Committee members have full access to voting rolls and day-by-day turnout figures for every campus. We realize these are serious allegations. Our concerns about possible fraud are just that – concerns, based on real historical patterns and current anomalies. We have just received word that members will be allowed to observe the vote count, a positive sign for transparency. To those who would use these concerns to fuel an anti-union agenda here or elsewhere: get your sorry act out of here. We are pro-union, and we are engaged in the process of reforming our union, fighting for transparency and a real contract campaign, because teaching assistants, readers, and tutors need a democratic, creative union consisting of all of us fighting for fair treatment on the job in solidarity with students and other campus workers. We criticize officials who have misused our union, but we will not allow their misdeeds or anti-union propaganda to divide us. Update: Each campus will be allowed one No and one Yes challenger and all union members will be permitted access to witness the ballot counting.